The Setting—Christians in many countries today suffer ongoing persecution by members of majority religions. Jesus followers are often disowned by their families, beaten, and left for dead. They leave their home areas just to survive. And most of the churches in these countries have no Scripture in their languages. How then can believers and persecuted Christians grow strong in their faith when God's Word is unavailable to them in their own language? The Crisis—Thousands of language communities with no Scripture are in countries that forbid traditional missionaries. Other language communities live in the hardest to reach locations—high in mountain ranges, low in tropical jungles. We cannot overlook these communities just because they are nearly impossible to reach. The Need—During their last MAST workshop in Myanmar, Pastor Mana Saw said, "We know that every believer should learn and understand the Word of God. But without having one in our own language it was really difficult." 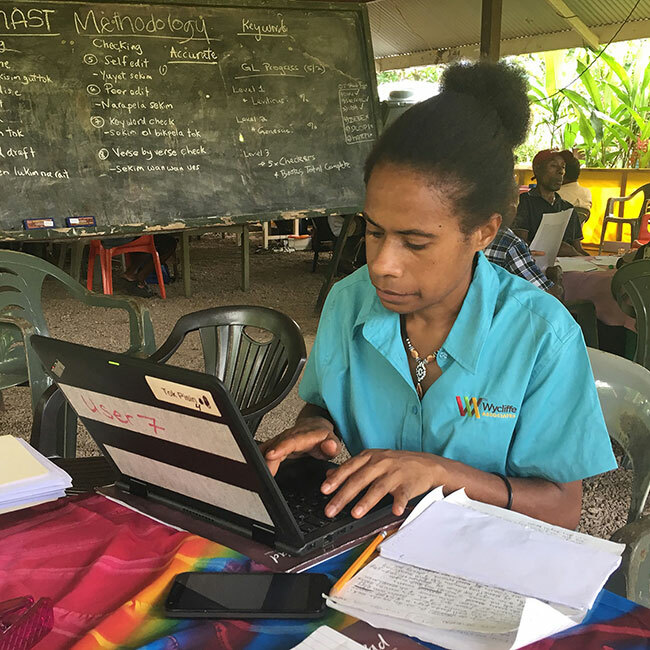 "Our breakthrough MAST strategy is accelerating Bible translation." says Bruce Smith. "It is not Westerners doing the translation work in remote areas—it's nationals being equipped to translate God's Word themselves." The Opportunity—In late 2014, Wycliffe Associates piloted a MAST workshop with national translators in just such a nation where Christians suffer ongoing persecution. Yet thirteen translators attended MAST, were divided into teams of three or four, and each team was assigned one of the four Gospels: Matthew, Mark, Luke, or John. Every team member was then assigned a portion of that book to translate. Working 12-hour days, each translator completed approximately 34 verses each day, drafting during the mornings and using a five-step process to quality check the verses in the afternoons and evenings. Dr. John Luton, who has participated in checking the work of numerous translation projects around the world, says, "The work produced through MAST methodology is excellent. It compares very favorably with texts produced through other methods." With this new collaborative translation method called MAST (Mobilized Assistance Supporting Translation), the entire Bible can be translated quickly and accurately. Now more groups are seeing the results—and they want to launch workshops for their own people. "Now that we have the whole New Testament in our hand," said Pastor Saw, "we will be able to read it in our own language, understand it, and will even be able to share it with others. We are so very happy, and we thank the Lord for what he has done for us using Wycliffe Associates." The Cost—The MAST program is being requested by national church leaders around the world. A MAST workshop takes only $19,500. Will you help get the Bible to an unreached language group sooner rather than later? How about supporting a team of nationals using the MAST program to translate the Bible into their language? People around the world are clamoring for God’s Word in their own language. We can’t deny them!